Nigh on every form of industry uses some sort of promotion to sell their services or wares. Hoteliers. Restaurants. Retail outlets. High Commerce. Governments. Media Hubs. And even the Army. That’s right – I said the Army. As depicted in this film Directed by David Paltenghi; and Starring: Peter Sellers, Tony Hancock, Sidney James, and Bill Fraser. It was made in 1954, and lasts for 74 minutes. American director, Ed Waggermeyer (Sid James), goes to an English army barracks with his cast and crew, and decides to shoot a science fiction movie there. Now, depending on their perspective, this is either great news or bad news amongst the masses. For band conductor, Lieutenant Wilfred Cartroad (Tony Handcock), and compound caterers, Slee and Goffin (Bill Fraser and Peter Sellers), they think this is a fantastic turn of events. However, for Captain Harper and Colonel Bellamy (Brian Reece and Raymond Huntley), they need some feminine persuasion from leading actress, Wanda Sinclair (Margot Grahame), first, before they allow this production company to go ahead and carry out their task. During pre-production, though, a number of unfortunate scenarios come into play, thus causing quite some commotion to boot. Firstly, Slee and Goffin try to ruin the Captains love life, whilst at the same time skimming some cash out of Waggermeyer pocket. Secondly, Cartroad’s band interrupts Waggermeyer scripting seasons, causing him to loose his rag and let rip a whole slew of obscenities. And thirdly (or finally for those of you who don't like to count), the Colonel does not like to be told how to act in front of Waggermeyer lens, causing Waggermeyer to get annoyed once more. Oh! But wait! That’s not all! Out of the blue, the General Inspector shows up during dress rehearsals, causing a whole new set of problems barring Waggermeyer’s path towards moviedom! Well, I suppose that is why what next transpires is in jovial, regimental, and all in all, somewhat perfect taste. As caterers are court-martialled – Captains crave courtship – Corporals cling to condescension – productions are re-played – and so does the band too, A-TEN-SHUN! 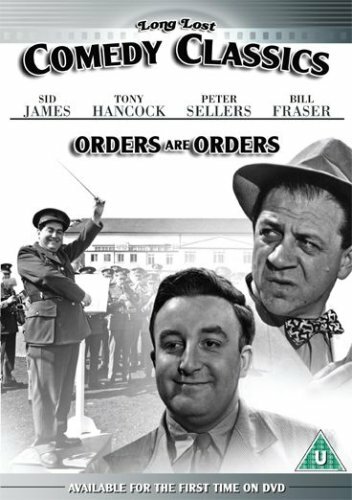 'Orders are Orders' is an old Black and White movie which was made back in the day, when class, rank, and characterization, were the key to unlocking 'what was what', in all British filmic-fair. Now by no stretch of the imagination is this a Peter Sellers or Tony Handcock film. No sir-ree. Though to some extent it is a Sidney James film. Quintessentially, however, this is a movie about jovial hi-jinks, and the way that scenarios and ploys will always loose out to regimental routine and order. OK, I know that this does not make this movie sound like a ‘laugh riot’, full of mirth, misfortune, and muggings miggins (go to the library, as Google goes not know what this phase means either). Nevertheless, that is precisely what this film is. But does any of what I have just said make ‘Orders are Orders’ a good film or a bad film? Hmmm? Depends I suppose. If you like quaint black and white comedies with old style British charm – this film is just perfect. Though if you want a slick, quick, wham, bam, thank you mam, style of a movie – your sh*t out of luck. Personally speaking, from my own biased perspective, I kind of liked this film. In places, it was genuinely laugh out loud funny, with Sidney taking the lead with his over the top characterisation of a loud mouthed movie director. Both Peter Sellers and Tony Hancock were great in this movie too – though there lesser roles seemingly propped up the overall narrative, making there presence felt yet fleeting. As for the other more pronounced actors in this film on the other hand, such as Brian Reece and Raymond Huntley, they do a bang up job quite eloquently as well – with both of them having a presence that is very reflective of the times. Oh! And I best tell you that Eric Sykes and Donald Pleasence show up in a scene or two – though individually, and mealy for a couple of minutes at a pop. Now if this film does have a bad side to it, it would have to be that the overall structure of the piece is fragmented in tone, and the through line does appear to stop and start in-between the more skit like material. This movie plays for 74 minutes approximately, and I would guest-i-mate that only seventy percent of it is actual story – with the rest seemingly an excuse to showcase Tony Hancock or another subservient actors performance. Also, there are times that the language used could be perceives as too colloquial in flavor. Thankfully, though, I am very proficient in recognizing some of these old sayings – but I am not sure that most other people are. All in all ‘Orders are Orders’ is a really nice old style film to watch. It reminds me of a vintage 'Carry On' film mixed in with a 'Bolting' film plus a touch of 'Elstree' for flavor. So if you are a fan of films such as ‘Carry on Sergeant’ or ‘Two Way Stretch’, or alternatively like some of the earlier works of Peter Sellers or Tony Hancock – go ahead old chap – do what one has to do.